As it is 0.6mm, it is convenient to be able to solder small parts comfortably. Easy to use. This review is about item#19532546. Normally, I use 1 mm solder, but recently I used 0.6 mm because there are many chip parts and 1 mm is too thick. As there was no solder used, we purchased anew. Recently there are many smokeless solders, but since old repair products have many leaded solders, they are used here because it is difficult to mix them. There is no problem in using it. I knew that there was a thin thing in the Handa era, so I could use it as a point in a small amount at a necessary point and I could not get it with a button. This review is about item#19532564. I can use it without any problem separately, I ordered the wrong weight again. 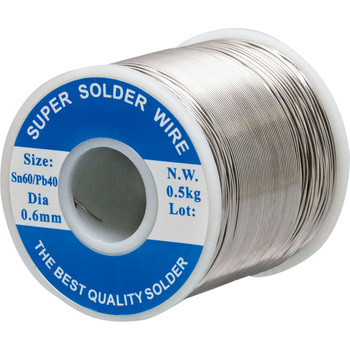 The thickness of the solder, 08 mm, is useful because it increases work efficiency. This review is about item#9151536. Until now I have purchased a little more solder, but if there is only this, it seems to be used without worrying about the remaining amount. It does not get caught by famous manufacturer's things, and it is excellent in all aspects. The price is also reasonable. This review is about item#9151511. It is relatively cospa, it seems there is no problem with quality. It is easier to use as the combination of thickness and weight further increases. This review is about item#09151536. The price is reasonable, workability, durability has never been a problem at all. It is the second use on a continuation, but I also want to use the next. This review is about item#9151527.